Peace is far too serious to be left exclusively to governments. GENEVA (AP) — Israeli and Palestinian activists launched an unofficial peace treaty aimed at ending one of the world's most intractable conflicts, backed by a gathering of Nobel peace prize winners including former President Jimmy Carter. Still, strong opposition from Israeli Prime Minister Ariel Sharon and last-minute dissension within Palestinian ranks underscored the problems facing the plan — dubbed the "Geneva accord" — that resulted from two years of secret negotiations. "It is unlikely that we shall ever see a better foundation for peace," said Carter, after receiving a standing ovation from a packed Geneva conference hall. "The people support it. Political leaders are the obstacle to peace." Carter criticized the Bush administration, saying it had supported Israel but ignored the well-being of Palestinians. He also criticized Sharon's government for allowing the number of Jewish settlements to skyrocket. Carter said Israelis had to ask themselves: "Do we want permanent peace with all our neighbors or do we want to retain our settlements?" Palestinians also must halt violent attacks on Israelis, he said. Actor Richard Dreyfuss, master of ceremonies at the event, said that "peace is far too serious to be left exclusively to governments." "People are terrified of the world they seem to be leaving to their children," he said. "(This initiative) is the people's claim to their place at the table." The Geneva plan has been welcomed by U.S. Secretary of State Colin Powell, U.N. Secretary-General Kofi Annan and leaders of the European Union. Fifty-eight former presidents, prime ministers, foreign ministers and other global leaders also released a statement Monday expressing "strong support" for the accord. "The Israeli-Palestinian conflict has taken far too great a toll already," said the leaders — most of them Western European but joined by former presidents Mikhail Gorbachev of the Soviet Union, F.W. de Klerk of South Africa and Ernesto Zedillo of Mexico. Work toward the accord began two years ago in an academic discussion at the University of Geneva between former Israeli Justice Minister Yossi Beilin and Professor Alexis Keller. They enlisted then-Palestinian Information Minister Yasser Abed Rabbo and began talks, with financial support provided by the Swiss government. The auditorium for the ceremony featured a large sign declaring, "There is a plan." 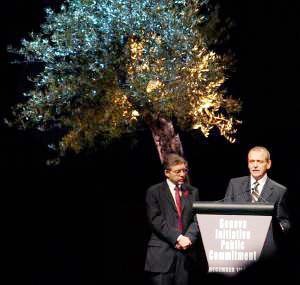 An olive tree was on the stage. • Place 4 peace: An interactive site dedicated to the Israeli-Palestinian Peace Process. • The debate in Israel has been extraordinarily heated. Mr Sharon's supporters accuse the plan's Israeli authors of being traitors for taking part in unofficial talks with "the enemy". One of Mr Sharon's advisers, Ra'anan Gissin, said yesterday: "Creating the impression that this is some sort of alternative ... causes some damage to Israel and is just a repetition of mistakes." Isy Levy-Mazloum, a representative of Mr Sharon's Likud Party, said: "Far from bringing peace, this initiative will simply make discussions between the Israeli government and Palestinian Authority more difficult." He said the agreement "flouts the rights of the Jewish people". • Among Palestinians, the debate has been even more charged. Four of the Palestinian delegates who were at the ceremony yesterday, including two cabinet ministers, nearly cancelled their flight and stayed at home at the last minute, after receiving threats. They only agreed to go after Mr Arafat said they were travelling with his approval, and sent his chief security adviser, Jibril Rajub, with them. Mr Arafat and the Palestinian Authority have stopped short of endorsing the accord, but they have said they welcome the initiative. But many Palestinians are enraged by the Palestinian negotiators agreeing to drop the right of return. Shots were fired at the house of the main Palestinian author of the plan, Yasser Abed Rabbo, in Ramallah, and delegates on their way to Switzerland were jostled by angry crowds as they tried to leave the Gaza Strip. Most of us, on the right and the left, understand that a genuine final status agreement will closely resemble the Geneva model. It was Ehud Barak, one of the most vehement critics of the Geneva document, who said the main frames of the future peace agreement are well known, and so the only remaining question is how many people have to die before it is finalized. The Geneva Accord incorporates the most important lesson that was learned during the Oslo process. Oslo was referred to as a measured, incremental process. Today it is clear that one can't leap into the water in stages. Only a final status agreement, after which neither side can legitimately retain claims against the other, can build up confidence, and lead to a new reality. The makers of the Oslo process were afraid to talk about settlements, Jerusalem, refugees - and even about a Palestinian state. The lesson was learned. The Geneva document that has been presented to the public is a model that proves there is a partner with whom all of the problems can be solved, and, indeed, that ultimately all of the problems are soluble in a way that guarantees Israel's existence as a strong, Jewish, democratic state. Under the agreement, Israel's air force planes can fly in the air space of the neighboring country, and it will operate intelligence warning stations in that country's heartland. For years after the signing of the agreement, Israel would deploy its soldiers in the Jordan Valley; and international peacekeepers would monitor compliance with the agreement within the state of Palestine. The new state of Palestine would be demilitarized, divided into two regions, weak economically, and dependent upon the goodwill of its neighbors. So, under this scenario, who ought to be afraid of whom? Nonetheless, for the sake of argument, let's imagine the worst-case scenario. First of all, the period stipulated by the agreement for Israeli withdrawal stretches over two and a half years; during this time, the Palestinians are to be scrutinized mainly for their efforts in the war on terror. Should they not put up a fight in that war, they will forfeit everything that the agreement promises them. And were terror to resume after the agreement is implemented, Israel's position would be solid - we would have carried out a unilateral withdrawal in compliance with an agreement, and with the backing of the international community. Under such circumstances, whoever might still long for the Casbah markets of Nablus, could return to them. Gadi Baltiansky was press spokesman for prime minister Ehud Barak, and today directs the Peace Through Education company, which promotes the Geneva Accord initiative. 3 Jul 2006 @ 01:48: Where is Abel thy brother? 31 Mar 2004 @ 11:47: And we, who are we anyway?